A third European final in a row for Chelsea looked to be heading for extra-time after a Benfica penalty had levelled up Fernando Torres’s second-half goal, but with stoppage time underway, Branislav Ivanovic’s superb header won the Europa League. Both halves followed a similar pattern, more possession and territorial advantage for the Portuguese side butFrank Lampard came closest to scoring before the interval, and he hit woodwork late in the game too. Torres’s strike, his sixth in this competition this season, came on the hour, the Spaniard expertly finishing off a counter-attack. The penalty, for handball soon after, was despatched by Benfica’s leading scorer in the tournament, Oscar Cardozo. Ivanovic’s decider was from a Juan Mata corner. The Blues have that winning feeling yet again. With John Terry unable to recover from his ankle injury sufficiently, Branislav Ivanovic came into central defence alongside Gary Cahill. Both wingers were changed from the weekend win at Villa, Ramires moved to a wide-right position for this game with Oscar coming in. They replaced injured Eden Hazard and Victor Moses, who was on the bench. David Luiz played alongside captain-on-the-night Frank Lampard in midfield with Fernando Torres leading the attack. 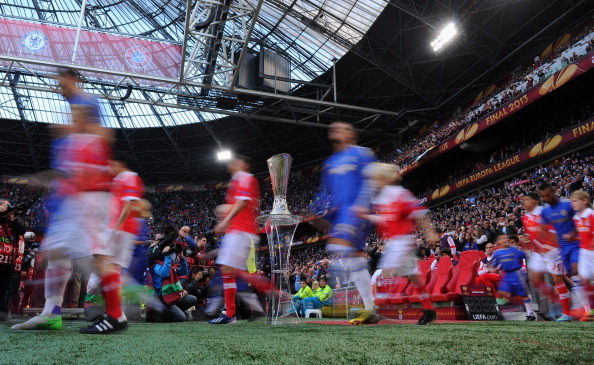 Benfica had one enforced change from the semi-final with right-back Maxi Pereira suspended. Andre Almeida moved across from left-back to replace him with Lorenzo Melgarjo coming in on the left. Nicolas Gaitan moved from midfield in the Fenerbahçe games to play as one of the front three. After an opening ceremony featuring plenty of giant tulips and windmills, it was time for the main event in the Dutch capital. The still-reigning European champions lined up against a club that had lost their previous six European finals. The first chance was for the Portuguese – and centre-forward Oscar Cardoza must have been unhappy not the head a cross from the right at least on-target with just two minutes played. Cesar Azpilicueta then had to get his chest in the way of a ball diverted towards the Chelsea goal by Ivanovic. There were words from the referee to Nemanja Matic five minutes in after he bundled Ramires to the turf on halfway, but no booking for the former Chelsea midfielder. Unfortunately Oscar couldn’t control a well-weighted ball over the defence by Juan Mata with the offside flag staying down. Worryingly, Benfica were finding a fair amount of space in the 20 yards up to the edge of the Chelsea penalty area, giving them the chance to work the ball into the danger zone. Ivanovic blocked a shot from Cardozo, followed immediately by Cole blocking Salvio’s effort. Then Gaitan skied a shot from inside the box and straight away held his head in hands. Other scrambles in front of Cech followed. Oscar was booked for illegally ending Perez’s run through the middle. Around the midway point in the half the game became stop-start for a period, which suited Chelsea given the flow of the match so far. With one of several free-kicks awarded, Mata drew a double-fist save from the keeper from out wide, and Artur’s handling wasn’t the best when Oscar shot at him from the outside the area. On 30 minutes Ivanovic caught Perez 10 years outside the Chelsea area after Cole’s clearance had fallen to the midfielder with the defence stretched. There was no booking however and danger soon passed when Garay’s free-kick struck the wall. Soon Gaitan side-footed a shot over the bar. Benfica were gaining the upper hand once again. Finally, on 37 minutes, Chelsea truly tested Artur and Lampard brought the best out of the keeper too. Picking up the ball in prime territory, the 203-goal man let fly and the ball was swerving away from Artur when he somehow adjusted his movement mid-air and saved with one arm. Lampard’s reaction was one of a man who knew most times he would have found the net with such a connection. Inside stoppage time, Torres and Ramires created momentary chaos in the Benfica rearguard, resulting in a deliberate tug on Oscar as he made a break through the middle. A yellow card was shown to Garay. Chelsea were asked to defend stoutly in the opening minutes after the interval, with balls coming in from both flanks, but still Cech had yet to be asked to make a proper save. Azpilicueta tracked inside diligently and hacked the ball off the toes of Salvio in front of goal when Cardozo had turned inside Cahill and squared. Cardozo had the ball in the net on 50 minutes but he was offside. Steadily Chelsea began to gain a foothold in the half. There were moves in and around the Portuguese team’s penalty area without openings found, but it was better from the men in blue. Then just before an hour was played, Cech launched a throw down the centre of the park. Mata may or may not have helped it on his way but he did enough to stop the Benfica midfield cutting it out. Suddenly it was at the feet of Torres and he had the strength to shrug off Benfica captain Luisao before sidestepping to the right of the keeper and making no mistake with the finish. It was a moment of vintage Torres striking. Luisao then picked up a booking for chopping down the Chelsea centre-forward in the next attack. The lead lasted less than 10 minutes. Azpilicueta, so unfortunate with penalty decisions in this Europa League run, was judged to have handballed a flick off the head of Lima, one of two substitutes only just introduced. The Chelsea right-back had little time to react to the touch but his arm was raised. Unlike in Munich a year ago, Cech was unable to keep the penalty out. Cardozo scored it. Torres wanted a penalty at the other end with quarter of an hour left on the clock when he and Luisao came together again but the Dutch referee declined. There was a plenty of contact. On 81 minutes Cech was finally called upon to show his talent in open play when Cardozo launched a rocket that was heading under the bar. Big Pete tipped it over. Spaces, inevitably at this stage of the game and this stage of the season, were opening up at either end. Ramirescharged into one but Luisao got across to tackle. With 87 minutes played, Lampard came within inches of winning the cup. Mata, who had not been heavily involved so far, worked some magic to push the ball out of a tight spot and our No.8 was running laterally when he thumped a shot from 25 yards out against the crossbar. Benfica forced Chelsea into some hurried clearing as the clock ticked towards the end of normal time, but then another tireless Ramires run won a corner inside stoppage time. Mata sent the ball over deep and Ivanovic, between two defenders rose sky high. His header arced beautifully over the grounded Artur before the Serbian slid joyously in celebration in front of the Chelsea fans at that end. What a moment for the man forced to sit out at Munich due to suspension. There was still time for one last Benfica attack – the ball running loose off Ivanovic’s shin – but Cahill was in the right place for a superb double clearance. A new trophy was ours.